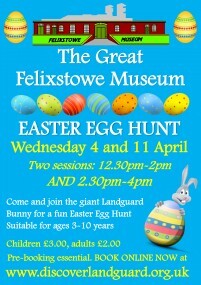 Come and join the giant Landguard Bunny for a fun Easter Egg Hunt at Felixstowe Museum. Search the museum for the coloured eggs, then exchange them for a yummy reward! Also fun bunny ears to make too. This event is suitable for children aged 3-10 years. You must pre-book in advance for this event. You can choose between two sessions. 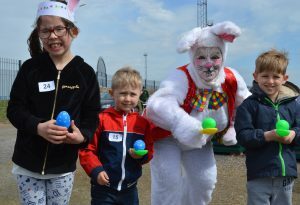 Each session includes the hunt and making bunny ears. Note this event is also running on Wednesday 11 April see seperate events page on this site.